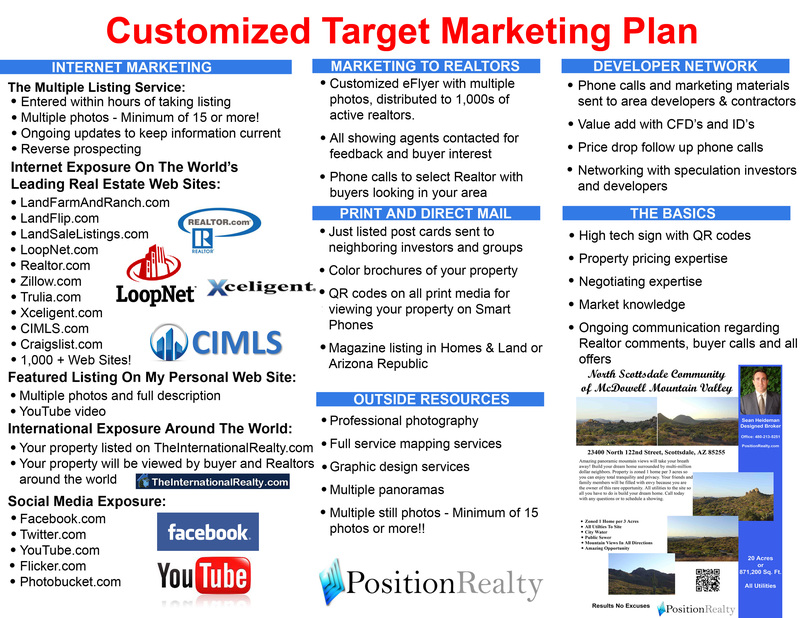 Position Realty is a leader in commercial and residential land brokerage throughout the State of Arizona by accurately analyzing market values, uncovering hidden investment opportunities, promoting clients properties effectively and forming personal relationships with landowners, developers and home builders. Marketing a land is a complicated process that only a few brokerage firms know how to do successfully. A detailed marketing system with time frames and accountability is needed. We approach marketing concisely and methodically, informing you of the progress on a weekly or semi-weekly basis. We seek to identify all competitive advantages offered by a property as well as competitive weaknesses we may have to overcome. A buyer is willing to pay more for a land because of its location, zoning, entitlements, site plans, shape, topography, distance to utilities, etc. Each property is unique in one way or another and in marketing your property we will use these unique qualities to sell your property faster. Why Is Land Such A Great Investment? We can help you uncover profitable commercial or residential land investments and advise you on how to strategically increase it’s value for a quick profit. Give one of our investment advisers a call to discuss your investment goals and objectivesTODAY! !